To the Franks, they were Northmen or Danes (no matter if they were from Denmark or not). The English called them Danes and heathens. To the Irish, they were pagans. Eastern Europe called them the Rus. But the Norse term is the one that stuck: Vikings. The name probably came from the Norse word vik, meaning “bay” or “creek,” or from the Vik area, the body of water now called Skagerrak, which sits between Denmark, Norway, and Sweden. In any case, it probably first referred only to the raiders (víkingr means pirate) and was later applied to Scandinavians as a whole between the time of the Lindesfarne raid (793) and the Battle of Hastings (1066). Thank the gods it’s Frigg’s day. Though Vikings have a reputation for hit-and-run raiding, Vikings actually settled down and influenced European culture long after the fires of invasion burned out. For example, many English words have roots in Scandinavian speech: take, window, husband, sky, anger, low, scant, loose, ugly, wrong, happy, thrive, ill, die, beer, anchor. . . . The most acute example is our days of the week. Originally the Romans named days for the seven most important celestial bodies (sun, moon, Mars, Mercury, Jupiter, Venus, and Saturn). The Anglo-Saxons inserted the names of some Norse deities, by which we now name Tuesday through Friday: the war god Tiw (Old English for Tyr), Wodin (Odin), Thor, and fertility goddess Frigg. Around the sixth or seventh century, Buddha statuettes were made in north India. As the Viking era came to a close, a traveler brought it to the trading island of Helgö, Sweden (a Celtic bishop’s crozier was also found nearby). Scholars believe the statue may have been used as an amulet since it was discovered with a leather strap around its neck. Such lucky charms were apparently popular among Vikings, who were eager to incorporate other religious symbols to make them luckier. Icelandic amulets, made in the 900s, incorporates the Christian cross neatly into the hammer of Thor. The earliest known Scandinavian crucifix, found in Birka, Sweden, also dates from the 900s. The truth about Hagar’s helmet. 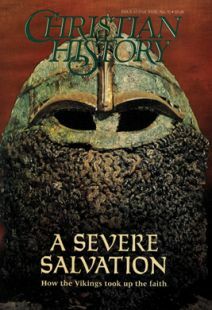 Though it may not come as a shock that Hagar the Horrible isn’t historically accurate, he reinforces the most widespread myth about the Vikings: they had horns on their helmets. Actually, Vikings weren’t depicted with horned or winged helmets until the 1800s. The only examples of any helmet ornaments is from the late Bronze Age (800–400 B.C. ), and these are bird beaks of bronze, not anything like cattle horns.